Scientists work with ever-more complex technical data, tools and theories to address important challenges in the world. And public support is critical to ensure this work moves forward. But scientists often find it difficult to connect with the public, especially when problems are complex and emotionally-charged. Therefore, we need to look broadly for new approaches to bridge this gap, and Hollywood-style storytelling can help! I have been a big fan of Randy Olson, PhD scientist turned filmmaker, ever since I read his first book, Don’t be Such a Scientist, in 2009. I have recommended and/or physically given copies of that book to more people than I can remember. My own copy has a big hole burned through the cover after I put it in front of a LCD projector lamp during a communication workshop in Nairobi five years ago. This book has been around the world with me! 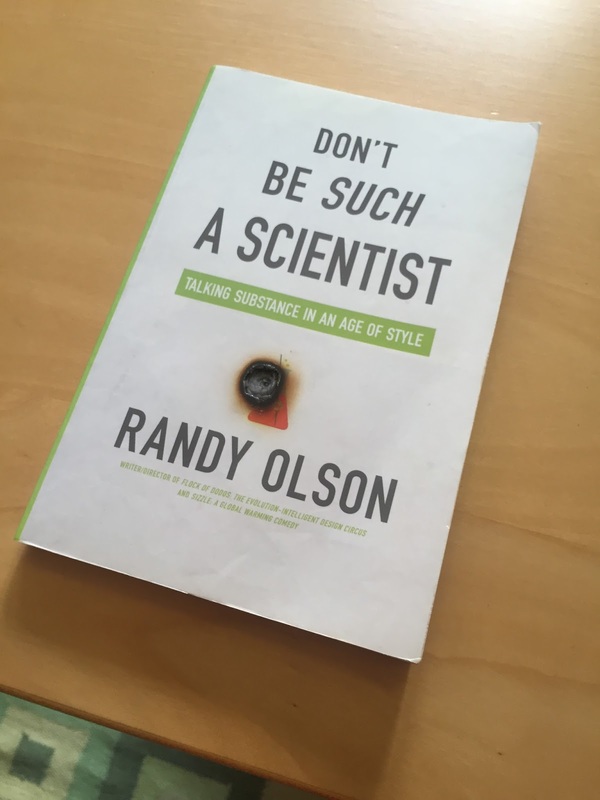 Although I had already worked with scientists for more than ten years when I read it, I learned a lot about the culture of science when it comes to communication within that community. It explains why scientists have the instincts and practices they have, and then tells them in no uncertain terms why those won’t work with the public. The chapter titles are good indications of what I want my scientist friends to hear from one of their own! It is an excellent, excellent book, and one that I still recommend and give as a gift to my favorite new scientists! No scorches or scars yet, but lots of notes! This new book goes more deeply into storytelling as a key communication practice that has the ability to cut through all the distractions of our modern world. 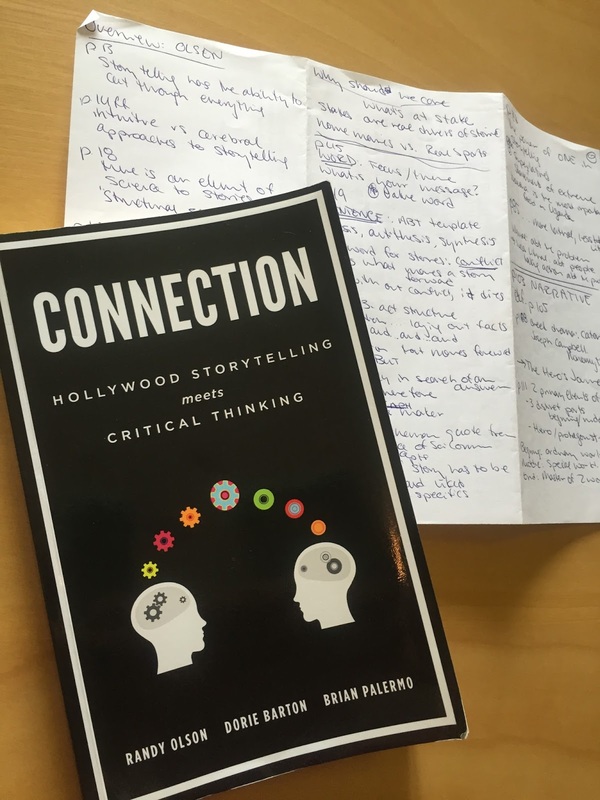 Working with Hollywood-type co-authors Barton and Palermo, Olson acknowledges that there are intuitive and cerebral approaches to storytelling, but believes there is an element of science to stories that work. He proposes a Word – Sentence – Paragraph (WSP) structure to get us started. Find an evocative word that captures the core theme of the message to be shared. That part is pretty easy actually. Then tell your story in a sentence that gives one fact AND then another, BUT introduces a point of conflict or contradiction, before resolving with a THEREFORE statement that can resolve the tension. I recently shared this And-But-Therefore template with a group of nutrition experts at the end of a very intensive two-days workshop here in Singapore, encouraging them to think about summarizing their experiences in a word, and then a sentence. For example, “My job is focused on this challenge AND I usually approach it this way, BUT at this workshop I learned about successful experiences of others using different tools, THEREFORE I’m going to explore this area more.” It’s a perfect one-sentence summary for the seatmate on the airpline home and the boss back at the office. In an ordinary world…. A flawed protagonist gets their life upended when a catalytic event happens. After taking stock, the hero commits to action. But when the stakes get raised, the hero must learn the lesson in order to stop the antagonist, so the hero can achieve their goal. She breaks this classic storyline – which has informed countless novels, plays and movies – into 9 key elements. Any of us can use them to organize our message into a story that will capture our audience’s attention. And keep it. The final section of the book is written by improv actor Brian Palermo, and focuses on the more physical aspects of connecting with an audience. He explains how learning improvisation techniques can help us craft our stories by fostering creativity, and how improv can help us to be more relatable and therefore deliver our stories more effectively. It’s more about being relatable than it is about being funny. Anybody know of an improv class in Singapore? These are good books! And you should read them!! But you may not have time to do it right now. Therefore, I urge you to at least check out Randy Olson’s 2009 TEDMED talk (10 minutes) which focuses on the key elements.